We all brush our teeth regularly every day but the matter is how efficiently we are able to brush our teeth. The problem with the normal brush is that it’s hard to reach some corners of our teeth that we miss out in our everyday routine, it creates the problem in your teeth in long run. if you are cared about your teeth and looking for a better alternative to the normal tooth brush, here we are with the solution. ✔V-WHITE 360°Ultrasonic Automatic Whitening Toothbrush Convenient,Comfortable, Artificial intelligence, Automatically. 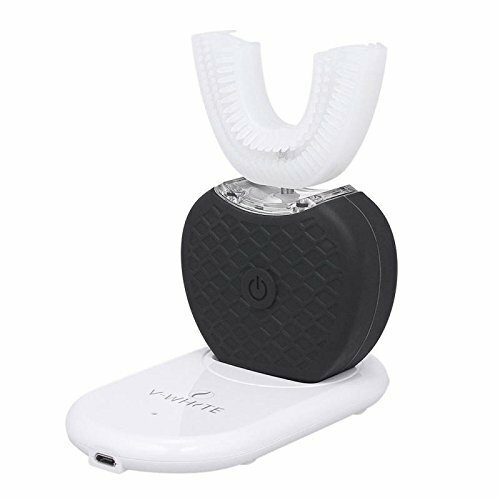 ✔Patented photo catalytic whitening technology paired with patented U-shape toothbrush bristle killing 99.99% oral bacteria. ✔45” smart timer with interval pause reminding each 10 seconds. ✔Sonic Technology, up to 48000times/min,remove stains and plaques effectively. ✔Brush teeth and whitening teeth in one function. ✔This electric toothbrush with LED cold light can use ordinary toothpaste. ✔The use of this product can be a good prevention ofgingival atrophy,promote the circulation of the periodontal blood,reduce the occurrence of periodontal disease. ✪ Ordinary toothpaste needs to first wet the braces, special foam toothpaste is not needed,put into the mouth, then start the switch, move left and right with the hand to touch the big teeth on the left and right sides, the best rate 63 times / minute, 30-45 seconds It can be done. ✪ Work less than 10 minutes every time. ✪ The power supply is less than 5V1A.